What’s the opposite of a growth miracle? Whatever the term, it applies in spades to Mexico in the Nafta era. Poor countries are expected to grow faster than rich ones, and they need to. Trade agreements are supposed to help. 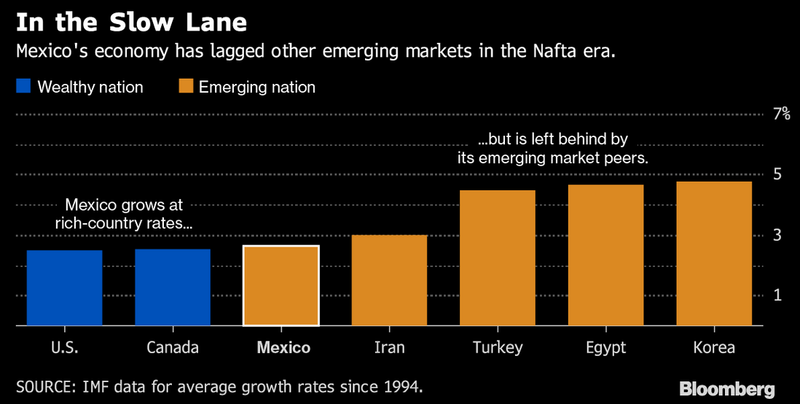 Yet by almost any benchmark — certainly the ones trumpeted by the deal’s architects a quarter-century ago — the Mexican economy’s performance has been dismal. Growth of 2.5 percent a year since 1994 is less than half the developing-world average. It’s pretty much the same as the U.S. and Canada. But even that’s misleading. Because Mexico’s population expands much faster, the economic pie has to be divided among more and more people. So the average Mexican earns less today, relative to U.S. and Canadian peers, than before Nafta. For an emerging market, Mexico has an impressive collection of billionaires, including the world’s sixth-richest man. Its poverty rate, meanwhile, is still around early-1990s levels — more than half the population, encompassing a permanent class of the underemployed. Crime and corruption are rampant. All this poses a problem for the U.S., especially now that Donald Trump’s in charge. Mexico’s glacial economy means there’s still a lively incentive for the things Trump hates: the flow of underpaid Mexican labor northwards, and American factories the other way. No wonder, as his trade team trudges through round after round of renegotiation, that the U.S. president is still threatening to blow up the pact altogether. It’s a much more urgent matter for Mexicans. And they’ll have a chance to do something about it in presidential elections next year. The early frontrunner, leftist Andres Manuel Lopez Obrador, says he’ll usher in a new economic model. What role Nafta would play in that, if any, remains vague. In Mexico’s policy circles, there’s little inclination to blame Nafta. Some point out that, while the economy clearly hasn’t boomed, it’s at least avoided the busts that sunk several Latin neighbors in the last two decades. Others say the trade pact couldn’t be expected to solve deep-seated problems on its own. Still, there’s broad consensus among economists that the promises made by Presidents Carlos Salinas and Bill Clinton at the dawn of Nafta haven’t been fulfilled. Rapidly expanding trade with the world’s biggest economy hasn’t been a panacea. Or even, some say, a paracetamol. Here, every analyst has a different list. Ruben Ojeda, an official at Mexico’s Finance Ministry in the 1980s, starts with the economy’s basic levers. He says policy makers, burned by a traumatic devaluation during the so-called Tequila Crisis at the end of Nafta’s first year, kept the monetary settings too tight long afterward — fixated on inflation (the central bank’s sole mandate) instead of growth. Ojeda, now a director at investment firm View Capital Advisors in Dallas, also says that Mexico didn’t learn a key lesson from the most successful emerging economies: industries need to be nurtured and protected before they’re exposed to competition. It’s not just labor making that case, north and south of the Rio Grande. Trump and his commerce secretary, Wilbur Ross, have complained about it too – channeling frustrations that helped the U.S. president to sweep the Rust Belt on his road to the White House. Getting Mexicans a pay rise has become an unlikely priority for his trade team – and for some Mexican business groups too. One of them, Coparmex, has been lobbying for a higher minimum wage, saying too many workers struggle to afford even basic goods. The rate will rise 10 percent to 88 pesos ($4.74) a day next month, but that’s only about half the increase called for by Coparmex, let alone the much bigger jump that would be needed to regain pre-Nafta purchasing power. And four-fifths of the external demand comes from a single country — now governed by Trump. If evidence of economic failure in the Nafta years has accumulated slowly, awareness of the political risks exploded on U.S. election day last year. Economy Minister Ildefonso Guajardo acknowledges the point. Revving up the domestic engine is a favorite theme of Lopez Obrador, known as Amlo. Another is sharing the pie more fairly. 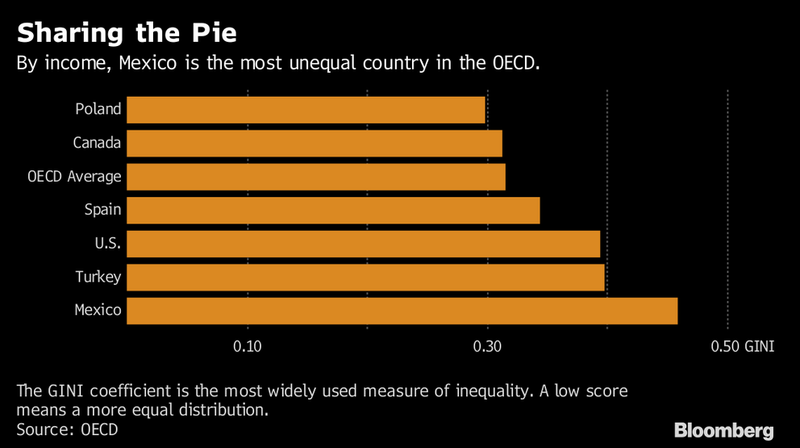 Mexico has the most unequal income distribution among the 35 OECD members. Carlos Slim, one of the winners from Mexico’s flagship privatization program, and three other billionaires hold wealth equal to about 8.5 percent of GDP, more than double the mid-1990s level, according to research by Esquivel, who’s worked as an external consultant for Lopez Obrador’s campaign. “This kind of inequality is a boon to Amlo,” said Nicholas Watson at risk-analyst Teneo Intelligence. Fiscal policy is the classical tool for fixing such imbalances. Mexico barely uses it. Government revenue is the lowest in the OECD — and because Mexico also runs one of the most balanced budgets, another cautious legacy of the Tequila Crisis, spending is constrained too. That’s helped win investment-grade credit ratings across the board. It’s also meant a failure to invest in skills, especially in science and engineering, that would help workers add value, says Manuel Molano, deputy director of the Mexican Competitiveness Institute. Korea’s a tough benchmark, but less stellar economies have also outgrown Mexico in the Nafta years: Turkey, which has a similar trade setup with its own giant neighbor, the EU; Egypt, which has suffered regime-change twice this decade; even Iran, almost completely frozen out of global commerce. And Mexico’s own performance in the quarter-century before Nafta was significantly better. On a per-capita basis, it grew almost twice as fast, though some slowdown is normal as countries reach the middle-income bracket. Some causes of the Mexican malaise aren’t strictly economic. Crime has surged, and is listed as a top concern of executives surveyed by the World Economic Forum. A brutal drug war has dragged on for more than a decade; even in its early years, policy makers estimated a hit to output of about 1 percentage point a year. Almost every analyst cites corruption, and a judicial system that’s failed to tackle it. In 2015 alone, state governments misappropriated about $1.4 billion of federal funds, according to auditors. That money could have been used to help develop Mexico’s poorer south, said Jonathan Heath, an economist at the Mexican Institute of Financial Executives. The region’s farmers haven’t benefited as factories sprang up along the U.S. border in the north. Under Nafta, “traditional agriculture was left to die,” said Ojeda. It was in southern Mexico that the most dramatic challenge to Nafta emerged — on the day the trade pact took effect. In January 1994, Zapatista rebels and their masked leader, Subcomandante Marcos, launched a violent revolt. The utopian ideas of the guerrillas have failed elsewhere in Latin America. Their uprising was rapidly crushed. 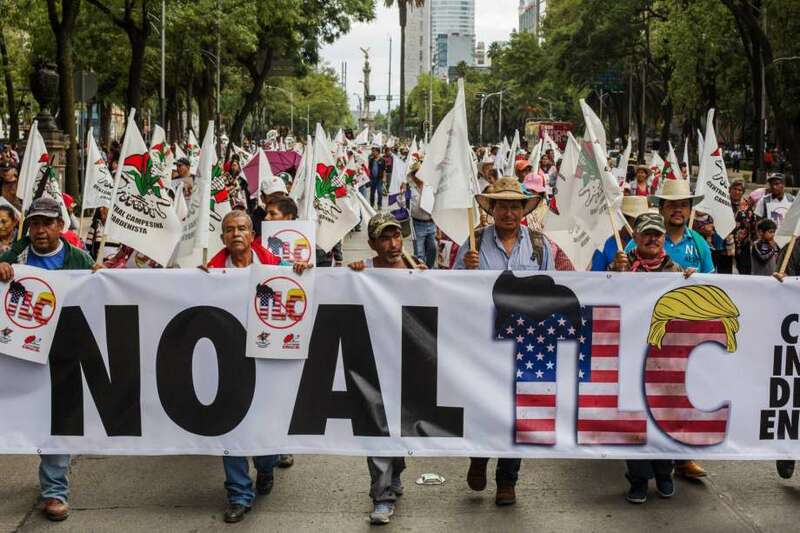 Their vision of a Nafta-era Mexico, with entrenched inequality, impoverished farmers and increased dependence on the U.S., has proved harder to dispel.